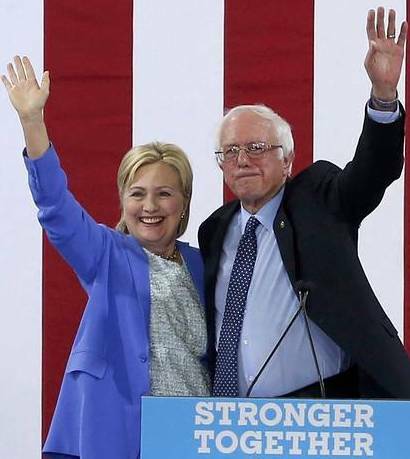 With two weeks to go before Election Day, Vermont Senator Bernie Sanders is vigorously campaigning for Hillary Clinton. Sanders is also making plans to lead his fellow Senate liberals in opposition to any of President Clinton’s efforts to back away from the current Democratic Party platform. Thanks to the aggressiveness of Sanders’ platform committee delegates, the platform includes strong domestic progressive planks. Unfortunately, thanks to pressure from Clinton delegates, the platform failed to take any position on the decades-long, illegal, U.S.-funded Israeli occupation of Palestinian territory. Sanders said he and his Senate allies plan to push for the breakup of “too big to fail” banks and to pressure Clinton to appoint liberals to key Cabinet positions, including treasury secretary. Senators currently working “informally” with Sanders include Elizabeth Warren (D-Mass), Sherrod Brown (D-Ohio) and Jeff Merkley (D-Ore.). The traditional swing states of Nevada, Pennsylvania and New Hampshire, and the newly competitive states of North Carolina, Missouri and Indiana, which historically lean Republican. (Bold face added). The Democrats need to pick up at least four seats to win the Senate majority if Donald Trump loses [five if he wins]. In two mid-west races, Democratic candidates in Wisconsin (Russ Feingold) and Illinois (Tammy Duckworth) are leading their races against Republican incumbents. Duckworth has been endorsed by the Chicago Tribune, a conservative newspaper, over incumbent Senator Mark Kirk (R-IL). In its endorsement of Duckworth, the Chicago Tribune wrote that a stroke suffered by incumbent Republican Mark Kirk, had reduced his ability to serve in the Senate. Kirk’s staff rejects this conclusion, but has thus far refused to provide medical records to refute the Tribune’s conclusion. In Wisconsin, former Democratic Senator Russ Feingold has held a consistent lead over incumbent Republican Senator Ron Johnson, the man who unseated him six years ago. Real Clear Politics reports the latest polling through October 18, showing Feingold holding a five-point lead over Johnson. Fifty Republican foreign policy experts have said Donald Trump would be “the most reckless president in American history,” given his lack of experience and rash temperament. Richard Burr, chairman of the Senate Intelligence Committee, surely knows how dangerous the impulsive, thin-skinned political novice would be in the Oval Office. Burr, perhaps more than any Republican senator, should have taken a principled stand against Trump. And yet, Burr has not. He has embraced Trump, putting his party and his own political expediency ahead of national security. . . .
Burr insists [his opponent is] too liberal for North Carolina. There aren’t many former ACLU lawyers who wouldn’t qualify for that label. While the Charlotte Observer endorsement will have the greater impact on North Carolina voters, Wednesday’s endorsement of Ross by The New York Times will add to her growing national recognition. Meanwhile, with only two weeks to go, the chances of Clinton returning to the White House as the first female President in the nation’s history, remains virtually certain. As a result, Paul Ryan, Republican speaker of the House, has shifted his campaign attention to electing down-ballot Republican U.S. Representatives. With the increasingly strong possibility of a Democratic majority Senate, the House is almost certain to remain Republican, under Ryan’s leadership. Politico reports that President Obama, who is campaigning for Clinton, is also investing his time, energy and growing popularity, to Democrats running for state senate and assembly. After a careful vetting, the White House says Obama expects to endorse as many as 150 candidates across 20 states. The endorsements — which will come along with a variety of robocalls, social media posts, mailers, photos of Obama with the candidates taken as he’s been traveling to campaign in recent weeks, and even a few radio ads — are Obama’s biggest investment in state races ever by far, and come as he gears up to make redistricting reform at the state level the political priority of his post-presidency. After January 20, President Obama will continue to live in Washington as long as he has a daughter in school there. He will be well-positioned to work to wrest away the power Republican state legislatures have held over redistricting once every ten years. He has the motive and he has the time. He will, after all, be only 55 when he enters his post-presidency. It is well to recall that Jimmy Carter was 66 when he began a post-presidency of many significant achievements. This entry was posted in Bernie Sanders, Donald Trump, Hillary Clinton, Politics and Elections. Bookmark the permalink. The hope we have out of this election is to have Hillary win, and for Sanders & Company to fortify the progressive positions that are needed to prevent Big Money from selecting our President, Congress, and Senate, and to bolster the American middle and poorer classes, in particular, and to break down the same-old, same-old rituals of futility. In this regard, and concerning Palestine-Israel, it will be crucial to raise a case against any official, or clandestine role by the US Government in funding and supporting “American” settlers in the West Bank and East Jerusalem. The same criteria should be demanded from the Russian Government, as well. Meantime, I am still hoping against hope that President Obama would assert America’s role in strongly proposing – or even imposing – an American-sponsored TWO-STATE Solution, that duplicates the pre-June, 1967, borders. The other option is a ONE-State Secular Republic that is a bi-National Democratic State of the Holy Land. And what remains to be hoped for is the support Obama might be willing to provide in less hemmed-in support of Palestine’s move toward joining the family of nations. Let’s dream big! Hillary and the Democrat’s anti-Russian stance and her willingness to revive Cold War paranoia and McCarthyism should rule out forever the idea that she is a “liberal” or “progressive”. Is it progress to return to unreasonable hostility? This article should help in understanding that it does not really matter who sits in the Oval Office or in Capitol Hill.